This is as close as I've gotten to the classic pickled cauliflower of my youth. You can also use this recipe for carrots, broccoli and other hard vegetables. And if you don't feel like canning, you can keep the pickles in the fridge for several months. The general method for this recipe is inspired by The Joy of Pickling, although I have changed the flavors around. Get a large canning pot full of water hot. Be sure it has a rack or a metal steaming insert to keep the bottom of the glass jars from touching the bottom of the pot. Toast the coriander, fennel and mustard seeds in a dry pan until they smell fragrant. Stir or toss occasionally. As soon as you hear the first seed pop, turn off the heat. 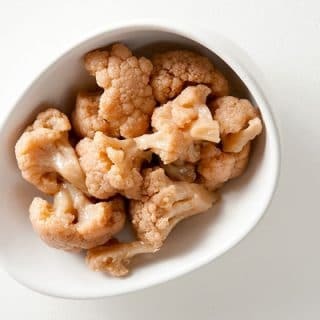 Meanwhile, break the cauliflower into pieces you’d want to eat as a pickle — neither too big nor too small. Do this by cutting down around the stem, then breaking the clumps of florets into smaller pieces. You may want to trim the stem pieces as you go. Divide the toasted spices, thyme and chiles into 4 clean quart jars. Pack the cauliflower into the jars, leaving 1/2 inch headspace. Boil the vinegar, salt and water and ladle into jars. You might have some left over, depending on how tightly you packed the cauliflower. Wipe the rims before you put on unused lids — you must use new lids every time, otherwise you might not get a proper seal; you can reuse the metal lid rims, though. Submerge in simmering water for 10 minutes, then let cool on a cutting board or rack. Wait at least a few weeks before eating. These pickles will keep in the pantry for a year. Refrigerate after opening, though. Serve these pickles alongside my brine pickled carrots and maybe some pickled artichoke hearts. A few slices of salami, some good cheese and bread and a bottle of wine and you're all set.